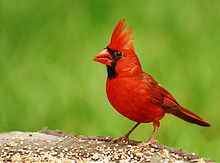 This morning on my prayer walk, I happened upon a pair of cardinals on the ground at a neighbors house, apparently shopping for a nice grass seed breakfast. They were so busy pecking here and there, they didn’t notice me or my nosy dog approach. But Fenway sure saw them. He began straining at his leash for enough leeway to get up close and personal with the new couple on the block, but I held him back so I could study them a spell. The little mister, in his gorgeous flaming crimson suit, became aware of us first. He skittered a bit closer to the female, in her much more subdued red plumage (like a faded housecoat), who was preoccupied with her shopping list. When she still didn’t look up as he hopped about in a distressed little “Hey, Edna, pay attention, will ya?” circle, he just up and flew away. At first glance it looked like the cowardly thing to do. Desert your woman at the first hint of trouble. Don’t hang around to help, just go do your own thing. Humph. I was totally indignant on her behalf. She just kept on pecking away at her chores, oblivious to the potential danger not ten feet away. I found myself channeling to my little feathered sister, “You deserve better than him, honey. Good riddance. What a jerk!” when the twit suddenly chirped a piercing chirp from a nearby branch so loud it made Fenway and me both jump. The lady bird immediately looked upward to where her fella sat perched high above the fray and flew directly to his side. I can only surmise he had squawked something along the lines of “Edna, get your tail feathers up here RIGHT NOW!” He then gently tapped her beak with his (could that have been a kiss peck?) and together, they gazed down at Fenway and me, both gawking up at them. Oh. Apparently I was mistaken. He wasn’t leaving her. He was leading her. The same way Spouse sometimes leads me when I won’t listen the first time he makes a suggestion. The way Papa God sometimes leads me when I’m too busy to hear His voice. Oh. Maybe I should try a little harder to pay attention in the first place to those who love me and are trying to look out for my best interest, instead of staying immersed in my must-do list.